Taylor and Sierra have been friends their whole lives, but Taylor is getting tired of Sierra’s endless need to be in the spotlight. Sierra is often reckless and thoughtless, assuming that Taylor will cover for her and lie to their parents if the opportunity arises for Sierra to have some fun. When Taylor and Sierra start chatting to the same guy online, it doesn’t surprise Taylor that Sierra is the one he chooses. It’s typical Sierra and Taylor’s had enough. She refuses to take any interest in Sierra’s plans to meet up with the guy in real life. When Sierra doesn’t return home as planned, Taylor doesn’t even care. It’s not the first time that Sierra’s been so caught up having fun that she’s forgotten to touch base. Except this time, Sierra hasn’t forgotten. Something has gone terribly wrong and Taylor and her friends are about to discover that Sierra’s recklessness will cause more problems than getting grounded and losing screen time. This modern tale of cyber safety grips readers from the first pages. I read the book in one sitting, as did my 14-year-old daughter. While the drama surrounding Sierra has readers hoping for the best in a bleak situation, it is the fallout of the situation amongst Taylor and her group of friends where the real emotional impact of the story is felt. This isn’t a modern fable that ends with a happily ever after for everyone but the ‘bad guy’. Risk shares the very real impact that cyber predators can have not just on their victims, but on friends, family, teachers, acquaintances and communities, with emotional and psychological damage experienced by a network of people surrounding the victim of the crime. Author Fleur Ferris is a former police officer and paramedic. Her experience in the frontlines brings an authenticity to this novel that leaves readers feeling a little shell-shocked at the conclusion. This is a very real story with a very relatable Australian setting and characters that you feel you could know. Risk is relevant and topical, highlighting the potential consequences of failing to take online risks seriously. Without hysteria or exaggeration, Risk reminds readers of the potential hazards of the online world. 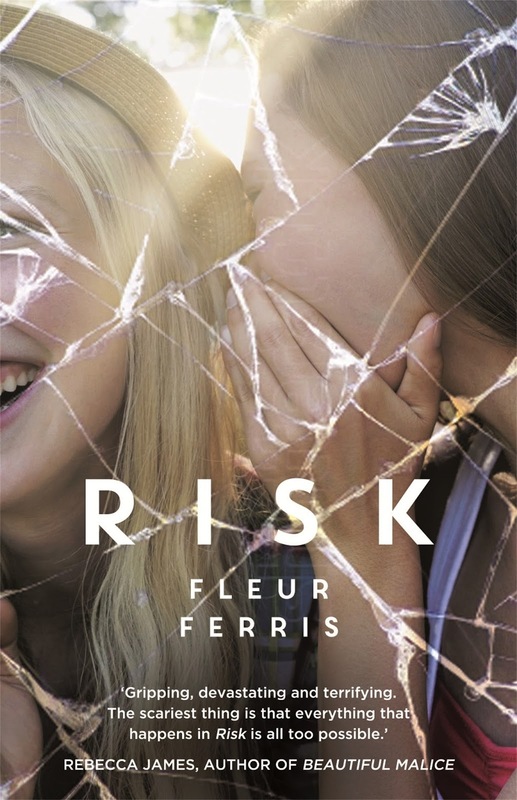 Reading Risk sparked some very interesting and important conversations between myself and my daughter about online safety, the importance of watching out for friends online, and the dangers of hiding risky behaviour, especially when it involves online indiscretions. Risk is a story that has remained with me long after I read the final pages. I have recommended it repeatedly in the past few months and will continue to do so. I think all teens and their parents and teachers should read this story. I gave a copy of this book to my children’s high school and I think that there should be a copy in every Australian high school library. Fleur Ferris is an amazing new voice in Australian YA fiction and I’m looking forward to reading more stories by this talented author. Note: This book includes references to violet and sexual behaviour. While these aren't explicit, parents should be aware that the content might not be appropriate for younger readers.